White over white with ¼” yellow rims, tangerine beards, sweet fragrance. Lemon & lavender over washed yellow, large purple rims & lines. Light orange flower, dark orange beards, horns. Standards and style arms pale straw yellow over falls: red-purple, faint rim of standards color, white lines around yellow beard. 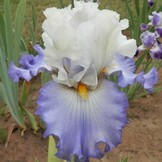 Light lavender-blue blends over very light blue, blue beards. Light butter yellow over blue-lavender, ruffled. rim, tangerine orange beards, sweet fragrance. White over blue, white beards, blaze. Fuchsia pink over amethyst pink, red orange beards. Ruffled purple black self, black beards. Red-black over darker red-black, dark bronze beards. White hemstitched with lavender, blue tipped beards. Light pink over pinkish orange, orange beards, musky fragrance. White infused light blue at base over medium blue, lighter toward beard, fine brown veins at hafts, darker vein around golden yellow beards. Old gold over blended violet, burnt gold shoulders, rims, & beards. Standards and style arms light peach-pink over falls: black violet, starburst of light peach-pink and bright violet lines, beards peachy-orange, ruffled, sweet musky fragrance. 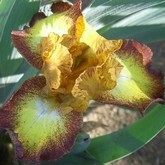 Ruffled white over orchid, light orchid rims, yellow center. Peach-pink, deeper hafts, orange beards, fuzzy violet horns, slight fragrance. Ruffled yellow & red over yellow, red brushings & rims. Ruffled orange flower with bushy dark orange beards. Rosy purple over white with rosy purple rims, yellow beards tipped white. Large, ruffled medium blue flower, lilac beards. White streaked with different shades of purple, burnt orange beards. Grey –tan over light lavender, yellow hafts & beards, sweet fragrance. Bright yellow over flared, white ground, veined bright red-purple extending to 1/8" yellow edge, white beards yellow in throat, slight fragrance. 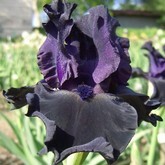 Ruffled, dark purple black, white spray near blue beards, sweet fragrance. Light lavender over white, ¼” purple rims, blue tipped beards. Peachy yellow over white, butterscotch rims, spicy fragrance. Ruffled blended blues, lighter rims, blue beards. Blended old gold and tan, rosy lavender midribs, very laced over light tan-brown, light flourescent violet area covering half of petal, lighter around beard, touch of old gold shoulders, gold beards tipped lavender at end, musky fragrance. White, blue-violet wash, gold hafts & beards, light violet flounces. Laced, orchid, yellow beards with feathered horns. 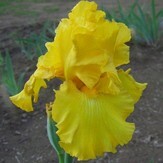 Ruffled deep golden yellow-orange, gold beards, slight sweet fragrance. Brownish gold over yellow, dark chocolate rims, white spot near beards. Ruffled, silver –white, yellow beards, light blue horns.